The Incheon Strategy to “Make the Right Real” for Persons with Disabilities in Asia and the Pacific provides the Asian and Pacific region, and the world, with the first set of regionally agreed disability-inclusive development goals. The Incheon Strategy goals cover a range of development areas from poverty reduction and employment to political participation, accessibility, social protection, education, gender equality, disaster risk reduction, data collection, CRPD ratification and international cooperation. To ensure that the 10 goals are successfully met, the Strategy identifies 27 targets as well as 62 related indicators for monitoring and evaluating the implementation of the 10 goals. These targets and indicators are essential for developing practical implementation strategies, ensuring success and identifying areas where significant challenges remain. Goal 8 of the Incheon Strategy accords particular priority to data collection, calling for improvement of the reliability and comparability of disability data across countries in the region. Member States, in target 8B, have specifically committed to establishing a baseline with reliable statistics by the midpoint of the Asian and Pacific Decade of Persons with Disabilities in 2017, as a source of tracking progress towards the achievement of the Incheon Goals. 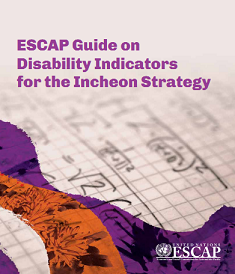 The ESCAP Guide on Disability Indicators for the Incheon Strategy aims to guide data collection and generation by ESCAP member States through providing them with relevant methodologies and tools to construct and use the 62 indicators of the Incheon Strategy, in order to monitor the achievement of the 10 disability-inclusive development goals.